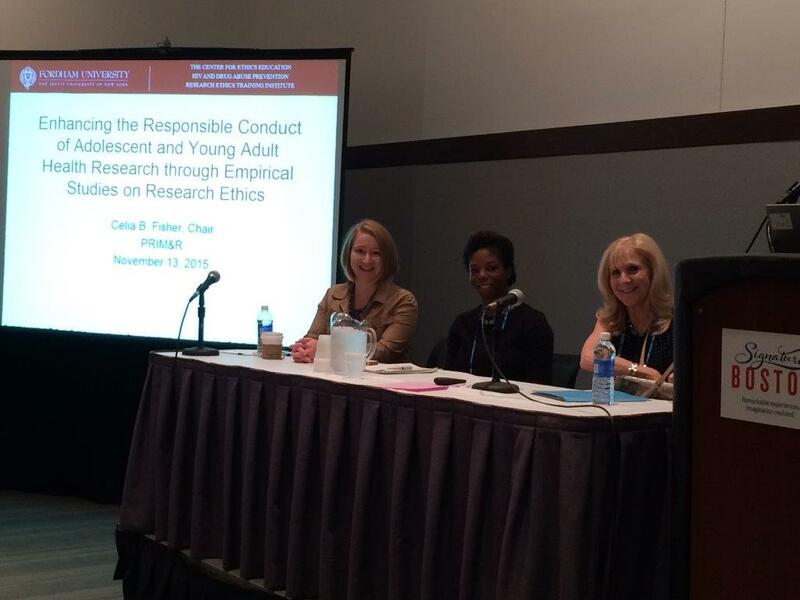 The Fordham HIV and Drug Abuse Prevention Research Ethics Training Institute (RETI) was well-represented at the Public Responsibility in Medicine and Research (PRIM&R) Annual Meeting in Boston, November 12-15, with faculty and fellows presenting on their institute-funded research. This session featured presentations describing empirical studies on research ethics issues that can help IRBs evaluate human subjects protections for health research involving adolescents and young adults. The research described draws on the perspectives of adolescents and parents to illuminate opportunities and barriers to the responsible conduct of HIV, drug use, and mental health research. During this session, Bonar reviewed how mixed-method research (surveys and interviews) can illuminate best practices for assessing risks and benefits and protecting confidentiality in mobile health-based research on drug use and sexual risk among emerging adults. In addition, Fletcher described how empirical data on African American mothers’ and daughters’ attitudes toward adolescent participation in HIV biomedical prevention trials can inform IRB evaluations of research vulnerability. Finally, Fisher outline how to evaluate ethical justifications for requests to waive guardian permission using data from an innovative, web-based, asynchronous focus group methodology that examined ethical barriers and facilitators to lesbian, gay, bisexual and transgender (LGBT) youth participation in HIV prevention medication adherence trials.